Large screens around St Mary's Basilica in the city and across the country broadcast Saturday's service live. Mr Adamowicz, a liberal critic of Poland's ruling party, served as the mayor of Gdansk for 20 years. What's the scene in Gdansk? The service has been held in the vast gothic St Mary's Basilica, where a black urn containing Mr Adamowicz's ashes was placed next to the altar, ahead of its permanent placement in one of the chapels. Mr Adamowicz's widow and two daughters attended, as did Polish Nobel Peace Prize laureate and ex-President Lech Walesa, and PM Mateusz Morawiecki. Gdansk Archbishop Slawoj Leszek Glodz addressed the service, saying Mr Adamowicz's murder served as an alarm bell for the people of Poland. "Our homeland needs harmony in politics," he said. Archbishop Glodz handed gifts from Pope Francis to Mr Adamowicz's relatives. 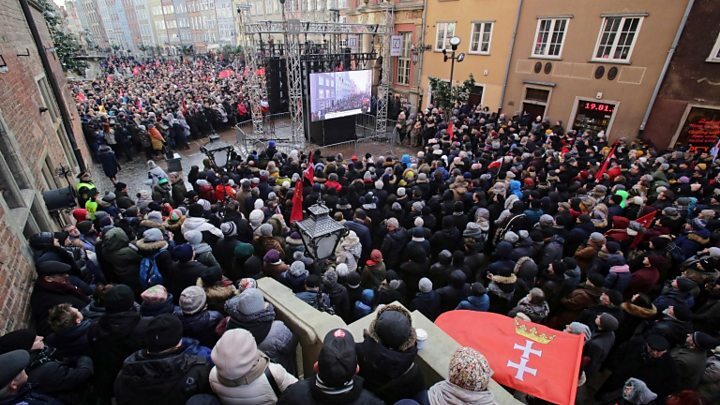 On Friday, a funeral procession was attended by thousands of people who followed Mr Adamowicz's coffin as it was driven through streets of Gdansk covered in white flowers and the city's red flag. Mr Adamowicz's body was then cremated. Mr Adamowicz, 53, was attacked on stage in front of hundreds of people while attending the Great Orchestra of Christmas charity - an annual event where volunteers raise money for medical equipment in hospitals. His death was confirmed by Poland's health minister on Monday. President Duda described the attack as an "evil hard to imagine". Mr Adamowicz was a popular figure - known best for his liberal political views and long tenure as mayor. 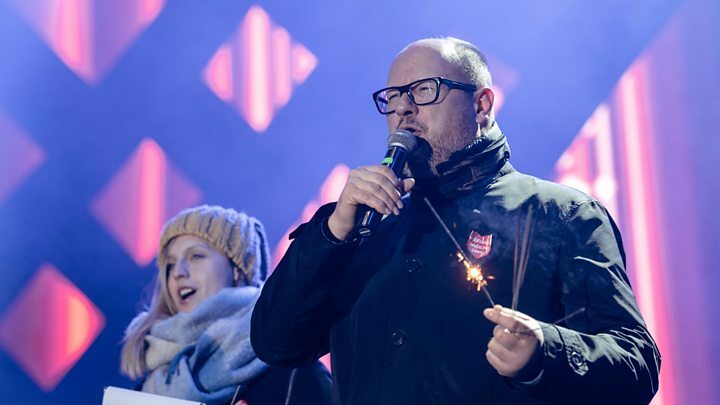 Stabbed Gdansk mayor: Who was Pawel Adamowicz?